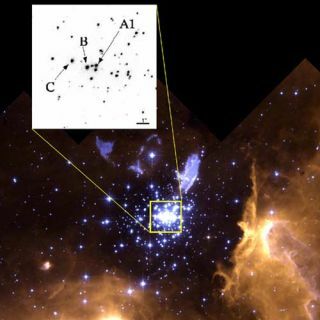 Hubble Space Telescope images of the young star cluster NGC 3603 showing the position of the newly-weighed most massive star "A1" and its companion "C". Astronomers have confirmed the weight of the most massivestar in the galaxy. This behemoth, estimated to be roughly 116 times the mass ofthe sun, dwarfs mostother stars in the galaxy. In fact, the next most massive star is about 89solar masses, and it is a gravitationally bound sister to the record setter. The next most massive ever weighed is 83 solar masses.Theory holds that stars can be up to about 150 solar masses. Discovery of the record-setting stars were first announcedlast year. The new measurements are rough, and the stars might turn out tobe considerably heavier or lighter. "A star having a little over a hundred times morematerial in it than the sun is rare," said researcher Anthony F. J. Moffatof the Universit? de Montr?al. "For every star like it you get tens ofthousands of stars like the sun formed. So finding them is hard. That?s whyvery few have been known and measured." Moffat, with Olivier Schnurr, Jules Casoli and Andr?-NicolasChen? and Nicole St-Louis of the Universit? de Montr?al used measurements fromthe European Southern Observatory's Very Large Telescope in Chile, and infraredimages from the Hubble Space Telescope to refine estimates of the two giantstars' masses. By measuring how the stars orbit around each other, theresearchers were able to calculate each one's mass, though the level ofuncertainty is still quite high (the larger weighs 116 plus-or-minus 30 solarmasses, while the smaller weighs 89 plus-or-minus 15 solar masses). Theastronomers hope to refine these calculations even further with futureobservations. The heavyweight binary, called A1, is in the star clusterNGC 3603, which lies in the Carina spiral arm of the Milky Way, around 20,000light-years away from our solar system. The two A1 stars are thought be "Wolf-Rayet"stars, which are very hot, heavy and evolved stars that appear to be losing alarge amount of mass in a stellar wind, similar to our sun's solar wind, butstronger. These stars are so large and luminous that the pressure of theiroutward-pouring radiation outweighs the inward pull of their gravity, somaterial is constantly being blown away into space. These stars can lose a significant portion of their mass ?ten of percent of their total bulk ? to this process over their lifetimes. Themore massive a star is, the shorter its lifetime, since it tends to burnthrough itself quicker. These very huge stars only live for 2 to 3 millionyears before dyingin supernovae explosions. Now that the researchers have found that the massive starsin A1 are Wolf-Rayet stars, it may help them locate similar finds. "We're on to something new, that the most massive starsare probably like this," Moffat told SPACE.com "This is a newrevelation, I think. We should look for Wolf-Rayet stars like this." Confirming the mass of these gigantors is important becausetheories of star formation predict the existence of extremely massive starsweighing up to 150 times the mass of our sun. Besides these two, though, noother stars yet discovered have come close to that upper range. The same research team previouslyannounced the discovery of this system in 2007, but the research had notbeen published yet in a peer-reviewed journal. In the meantime, they havefurther refined the measurements, and have recently detailed their findings inthe September 2008 issue of the journal Monthly Notices of the RoyalAstronomical Society.